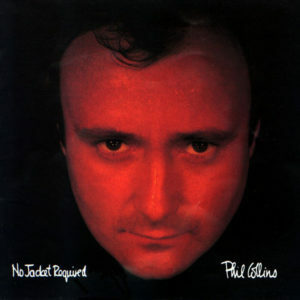 My brother picked up No Jacket Required by Phil Collins right around “Sussudio” was storming up the charts. When he played the album on the stereo, it was apparent he struck gold. For a while, I was a bit jealous. 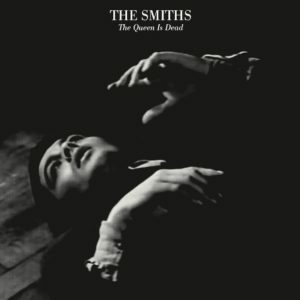 Subsequent singles from the album — “Don’t Lose My Number”, “Take Me Home” — would get played to death on every station. When No Jacket Required had run its course, I never wanted to hear anything from Collins again. I think even my brother was put off by the overexposure. Oddly enough, I had something of a crush on Collins. I’m not sure what triggered it, because he was no Sting or Huey Lewis. Even today, it puzzles me. I spotted a vinyl copy of No Jacket Required selling for $1 at Lifelong Thrift Store, and 30+ years seemed like a good enough temporal distance to re-examine the album’s initial appeal. The bona fides of the singles are very well established. What gives an album merit are the non-single tracks — do they stand up well against the radio hits? In the case of No Jacket Required, they do. That’s why it seemed my brother lucked out buying this album — any of the other tracks on the album could have been the next “One More Night” or “Sussudio”. Sting’s backing vocal on “Long Long Way to Go” complements Collins nicely, and it could have been quite the radio coup. The heavy-handed ’80s production dates the album like crazy, but abstracted from its sonic veneer, No Jacket Required really is a good album. And it would have been better if radio didn’t go overboard. When I spotted a vinyl copy of Harder Than You in the bargain bin at Jive Time Records, it had been close to 30 years since I first heard of 24-7 Spyz. Living Colour was all over the radio with “Cult of Personality”, but the music press pointed out Vernon Reid and company weren’t the only rock band with black guys around. Fishbone would release its second album, Truth and Soul, that year as well. Bad Brains had been around since the start of the decade. 24-7 Spyz tapped into the same creative vein as Living Colour — brutal guitars, funk bass lines and punctuating drums. In some ways, Harder Than You and Vivid are nearly interchangeable. Each album even includes a cover, although the Spyz driving cover of Kool and the Gang’s “Jungle Boogie” is truly transformative. Harder Than You, lacking the commercial polish Ed Stasium gives Vivid, comes across rawer and, well, harder. I remember Pulse! magazine plugging the hell out of this album with prominent advertising, glowing reviews and more than a few blurbs about the band. I don’t remember seeing the album itself in my local Tower stores, however. Its release on an independent label just about guaranteed it wouldn’t reach Honolulu. 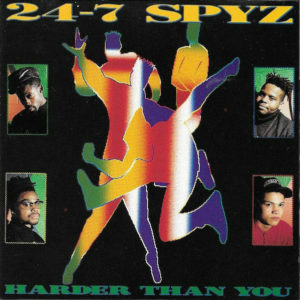 24-7 Spyz would eventually sign to a major label, by which time the line-up that produced Harder Than You had changed. The work from this brief era can be found on streaming services, but the band’s early output remains offline. If you find this album in the used bin, pick it up. 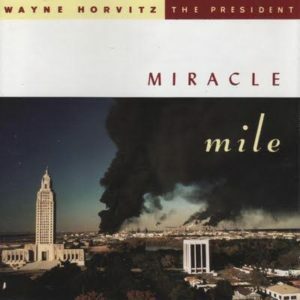 Back in 2008, I wrote a series of entries detailing my favorite albums from various decades. For the longest time, I held an incredibly dim view of 1992. Compared the years preceding and following, 1992 felt like a creative malaise had spread throughout the music industry. Bands that used to be underground found themselves to be popular, and under this newfound, wide-scale scrutiny, some of them cracked. I had only turned 20 years old, an age when the dopamine hit from discovering new music left a neophyte intoxicated. I wanted every album to matter, and the ones that didn’t received a harsh judgment. Twenty-five years later, I’ve got more of an education on where 1992 fit in the larger scheme of things, and of course, I got it wrong. This old entry details all the ways I got it wrong. So let’s make it right. Here’s a revised list of the Favorite Edition 1992. The original list stopped at five items, with a longer list of albums accompanied by explanations for why they weren’t favorites. In some cases, I’ve completely changed my mind. At the time, Love Deluxe was such a drastic turn for Sade that I thought something went wrong. It would take another 18 years for Love Deluxe to reveal itself as the start of a new creative era, one marked by extreme pauses between albums. This early ’90s album shares more with its successors in 2000 and 2010 than it did with 1988’s Stronger than Pride. I also got a chance to revisit Ingenue after the entry was written, and it’s place on the favorite list is well anchored. Other albums would not have appeared on the list at the time it was written. Prince was unexplored territory for me in 2008, so I wouldn’t have even thought to include the Love Symbol album. En Vogue wouldn’t have gotten past my raging rock snobbery. The rest of the albums on the list could have only been included after much research. Dirty makes a lot more sense if a Sonic Youth novice also considers Sister and EVOL. At the Ryman would not make sense to someone who’s only exposure to Emmylou Harris was Wrecking Ball. I’ve even had a change of heart regarding Faith No More and R.E.M. So it turns out 1992 wasn’t as bad as I remembered. It just took 25 years to reach that realization. It was the start of the century, and I volunteered to work behind the scenes at the Austin Gay and Lesbian Film Festival. Crowd control during screenings meant a lot of standing around, waiting for something to happen. Another volunteer with incredibly fashionable shoes started singing a vaguely familiar pop song. “Spice Girls!” he answered, aghast someone who would identify as gay would not know something so basic. Unbeknownst to him, I had been familiar with Spice Girls at one point. You couldn’t go to a gay bar without hearing the quintet’s latest single. I had enough gumption to buy the album that didn’t have Geri Halliwell. And yeah, I owned Spice and Spiceworld. They were casualties of a collection purge after the dot-com bust, and my tenure at Waterloo Records inflamed my rock snobbery. Spice Girls had been washed from my memory. 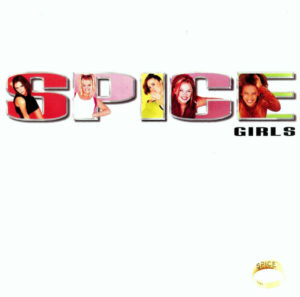 Spice is certainly a relic of the late ’90s, but it ages pretty well. The quintet’s girl-power mantra feels sincere on this first outing, while subsequent albums would suffer under the pressure to turn a quick buck. The album has its share of duds — I’m looking at you, “Mama” — but they’re offset by the likes of “Who Do You Think You Are” and “If You Can’t Dance”. On the whole, Spice is actually a cohesive effort, a pop album shooting for something beyond the top of the charts. A lot of big releases have been announced for fall, but few of them have much interest for me. I like you, Taylor Swift, but I accept I’m not your target market. I haven’t listened to STRAIGHTENER in years, but I can get behind a tribute album that includes ASIAN KUNG-FU GENERATION, THE BACK HORN, 9mm Parabellum Bullet and the pillows. I’ll settle for the 2-disc edition with the demos and b-sides. I’m not enough of a fan for the super deluxe edition with a concert recording and a DVD. Please, please be the album In the Lonely Hour could have been. I love Björk, but her albums aren’t ones you play for casual listening. Fred Schneider and Kate Pierson have released solo albums, and Cindy Wilson completes the triumvirate. Honestly? I’m kind of curious what a Keith Strickland solo album would sound like. I’m a U2 fan, but even I thought pushing Songs of Innocence into my iTunes library was intrusive. I ended up liking the album, but it ranks alongside How to Build an Atomic Bomb and All That You Can Leave Behind in the middle tier of U2’s output. I will listen to this new album regardless. I may even purchase it. I already grabbed an original pressing of this album a while back, but I’m glad to see it getting a reissue. Vinyl reissues for the band’s 20th anniversary. 20 years? Really? I’ve already placed an order for Futurama.